A 49-year-old female presented to the emergency department with acute onset of diffuse abdominal pain and vomiting of one day duration. Her vitals were stable and her abdomen showed diffuse tenderness. She was subjected to erect chest X-ray with both domes of the diaphragm [Figure 1], which showed air under the diaphragm. 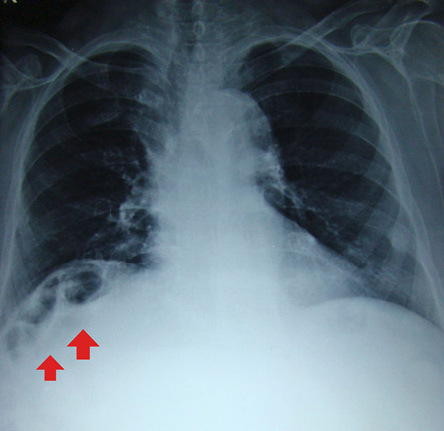 Figure 1: Postero-anterior view of chest X-ray showing air under the diaphragm (red arrows). b.Pneumoperitoneum due to perforation of hollow viscus. d.Hepatodiaphragmatic interposition of colon or Chilaiditi syndrome. a.Volvulus of the cecum, splenic flexure, or transverse colon. d. Hepatodiaphragmatic interposition of colon or Chilaiditi syndrome. Pneumoperitoneum refers to the presence of free gas in the peritoneal cavity outside the viscera.1 The common cause of pneumoperitoneum is perforation of a hollow intestinal viscus, which is a surgical emergency. Other causes are subphrenic abscess, posterior hepatic lesion, and retroperitoneal mass or postoperative status. Hepatodiaphragmatic interposition of the intestine (usually hepatic flexure of the colon) or Chilaiditi sign or pseudopneumoperitoneum is usually an incidental finding, which can cause confusion with other surgical emergencies. Pseudopneumoperitoneum refers to the presence of gas, which appears to be free within the peritoneal cavity but is in fact contained within an organ.2 Common causes of pseudopneumoperitoneum are given in Box 1. Box 1: Causes of pseudopneumoperitoneum. Morgagni hernia, bochdalek hernia, and diaphragmatic hernia. Subphrenic abscess caused by gas-forming organisms. Pyonephrosis caused by gas-forming organisms. Biliary, portal vein or bowel wall gas. Fat within the subdiaphragmatic space or the ligamentum teres. Large bullae at the base of the lungs. Hepatodiaphragmatic interposition of the intestine was first described by Beclere in 1899.3 Chilaiditi’s sign is named after the Greek radiologist Dimítrios Chilaiditi, who first described it in a series of three cases when he was working in Vienna.3 It is a rare condition with an incidence of 0.006­–0.2% with a marked male predominance (male to female ratio 4:1).4 It can be transient or permanent. Chilaiditi’s sign is asymptomatic interposition of the bowel at hepatic flexure of colon between the liver and right hemidiaphragm visible on chest X-ray, which is usually performed for some cardiorespiratory illness. When it is associated with symptoms like abdominal pain, vomiting, constipation, respiratory distress, angina like chest pain or very rarely with volvulus or features of obstruction, it is called Chilaiditi syndrome. Patients will be symptomatic in the sitting position and feel better in the supine position as the accumulated air ascends up when seated causing difficulties. Physical examination may show obliteration of the liver, dullness, and the liver may be pushed down and palpable. The absence of features suggestive of peritonitis helps to differentiate the condition from hollow viscus perforation. Haustral markings help to differentiate it from other causes of pneumoperitoneum. In patients with pneumoperitoneum the free air shifts with a change in the patient’s position in contrast to Chilaiditi, and a left lateral decubitus abdominal film may help to differentiate the two conditions.5 Linear atelectasis of the lung base situated above and parallel to the diaphragm can also simulate pneumoperitoneum, but can be easily differentiated by the presence of a normally aerated lung above and below the atelectatic band. Chilaiditi’s sign can be differentiated from diapharagmatic hernia by demonstrating the intact continuity of diaphragm. Complications are rare in Chilaiditi syndrome and include volvulus of the cecum, splenic flexure, or transverse colon and perforation of cecum, or subdiaphragmatic appendix.6 Undiagnosed Chilaiditi may result in perforation during liver biopsy and colonoscopy. 1. Williams NM, Watkin DF. Spontaneous pneumoperitoneum and other nonsurgical causes of intraperitoneal free gas. Postgrad Med J 1997 Sep;73(863):531-537. 2. Lo BM. Radiographic look-alikes: distinguishing between pneumoperitoneum and pseudopneumoperitoneum. J Emerg Med 2010 Jan;38(1):36-39. 3. Chilaiditi D. Zur Frage der Hepatoptose und Ptoseimallgemeinenim Anschlussan Drei Fälle von temporärer, partieller Leberverlagerung. Fortschr Gebiete Rontgenstrahlem Nuklearmed Erganzungsband 1910;16:173-208. 4. Yin AX, Park GH, Garnett GM, Balfour JF. Chilaiditi syndrome precipitated by colonoscopy: a case report and review of the literature. Hawaii J Med Public Health 2012 Jun;71(6):158-162. 5. Vessal K, Borhanmanesh F. Hepatodiaphragmatic interposition of the intestine (Chilaiditi’s syndrome). Clin Radiol 1976 Jan;27(1):113-116. 6. Ansari H, Lay J. Chilaiditi syndrome and associated caecal volvulus. ANZ J Surg 2011 Jun;81(6):484-485. 7. Sato M, Ishida H, Konno K, Hamashima Y, Naganuma H, Komatsuda T, et al. Chilaiditi syndrome: sonographic findings. Abdom Imaging 2000 Jul-Aug;25(4):397-399. 8. Saber AA, Boros MJ. Chilaiditi’s syndrome: what should every surgeon know? Am Surg 2005 Mar;71(3):261-263. 9. Blevins WA, Cafasso DE, Fernandez M, Edwards MJ. Minimally invasive colopexy for pediatric Chilaiditi syndrome. J Pediatr Surg 2011 Mar;46(3):e33-e35.